More or less the first two solvers are already presented in previous posts. Both TSP and AP can be implemented with vector based representation, which is already posted here. For transportation problem new chromosome representation have to be implemented. Before we go in to the implementation let give short introduction of Transportation problems. Transportation problem is one of the simplest combinatorial problem. It searches the determination of a minimum cost transportation plan for a single commodity from a number of sources to a number of destinations. It requires the specification of the level of supply at each source, the amount of demand at each destination, and the transportation cost from each source to each destination. Solution is to find the amount to be shipped from each source to each destination in such a way that the total transportation cost have to be minimized. A typical transformation problem is shown in picture below. In this example we have 3 sources and 4 destination. The supply is shown on Supply column, and destination cost is shown on the last row. Total supply and demand is 45. The unit transportation cost is shown on central table. The optimal solution is shown in picture below. The total cost is 315. The most natural way to represent this kind of problem is 2 dimensional matrix, because our solution must be presented as picture show above in tabular data. Theory behind matrix representation chromosome is beyond this blog post, so in the next section it will be shows only C# implementation with some description. If you want more information behind this implementation you can find it in the book: Genetics Algorithm + Data Structure = Evolution Programs which can be see at Google books at pages 187-191. This is main function for this type of chromosome because all other operations is based on this method. The second implementation is Crossover. // Crossover based on Book Genetic Algorithm +Data Structure = Evolution Programs. As we can see crossover method contain two calls for GenerateMatrix method which randomly initialize sub matrix chromosome. Mutation operation also depends of GenerateMatrix because it randomly choose location which needs to be recreated. The following code contains two Mutate methods where the second one calls GenerateMatrix for subMatrix random generation. ///  Mutation based on Book Genetic Algorithm +Data Structure = Evolution Programs. This was the code implementation around Matrix based Chromosome representation for Genetic Algorithm. The full source code about it will be published with the first beta of GPdotNET v3.0. I can promisse that the first beta will be out for less that month. Some times ago, I had to find problematically full path of Logging file, and open it through the Shell execute. I thought it will be easy, just get the file path from configuration file and open the file with shell execute. But things are different, because you cannot reach system.diagnostic section regularly. Suppose we have configuration file with diagnostic section defined similar like picture above. The solution must be very common. 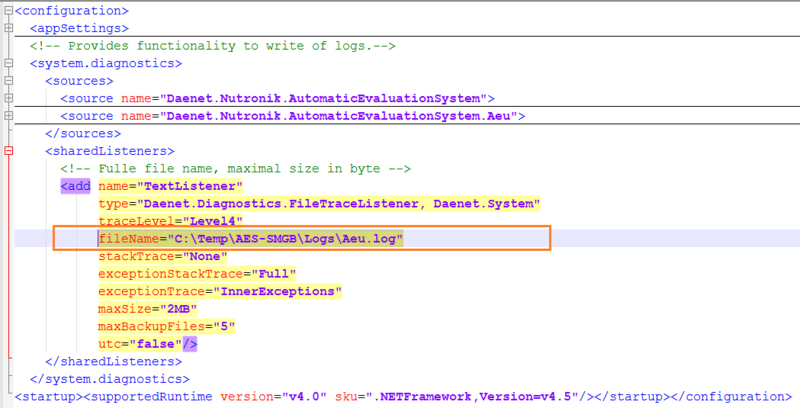 Open the config file, find section about logging, and read the path of logging file. The code snippet below shows how to achieve this. //Define XMLDocument for reading config file in to XML doc. //Open the log file from shell.